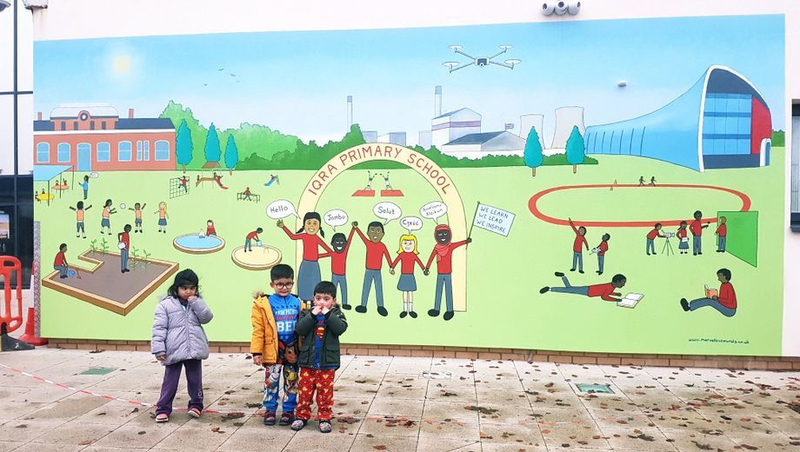 For this exterior wall mural the school had in mind something with bright colours that would welcome you as soon as you approach the building. The children of the school chose what they would like the best but what also represents Slough. In the background we have the industrial slough with its Mars factory, the train station and The Curve. In the foreground we have the children of Iqra playing and learning. This piece took us five days to complete, thankfully the weather was on our side. The size of this mural is Length - 730 cm, Height - 320 cm. It was a pleasure through the week to hear the feedback from the children and their families as the mural developed.